Colombia’s southernmost state, Amazonas, boasts four national parks and is home to some of richest biodiversity on the planet. From canoeing down one of the many tributaries of the Amazon River, to sleeping in floating houses, to dolphin spotting, and volunteering with endangered species, Colombia’s Amazon is bound to satisfy any eco-tourist’s cravings for adventure. Within the Amazon state, which takes up roughly 10% of Colombia’s total land area, the Huitoto, Yagua and Ticuna indigenous ethnic groups guard the invaluable national treasures of the region, according to Colombia’s official tourism website. Below, we’ve listed some of the best things to see and do in the Colombian Amazon, including some things you might not even find in Lonely Planet. No trip to the Colombian Amazon would be complete without a visit to Isla de los Micos Island (Monkey Island), home to nearly 5,000 playful primates. Leticia, a major port on the Amazon River, is not accessible by road from Colombia, so the best way to arrive is by plane from Bogota or by boat from Peru and Brazil, according to the Amazonas Colombia travel website. Leticia is the capital of the Amazon state and Colombia’s southernmost city, located at a tri-point boarder with Brazil and Peru. Unfortunately, the exact border lies somewhere in the Amazon River, so playing a game of “look how many countries I’m standing in right now” will be quite a trying exercise. Leticia has approximately 33,000 inhabitants and is the prefect first stop when exploring the depths of the jungle. Pro tip #1: Traveling into the jungle or by river always has its dangers, therefore it is best to be guided by professionals that carry first aid equipment, according to the Amazonas Colombia travel website. Although the Amacayacu National Park, meaning “river of hammocks,” has been closed since 2012 due to extensive flooding, many of the activities around the area are still accessible to tourists. In the area 30 minutes north of Leticia you will find 150 mammal species (including jaguars and tapirs), 468 bird species, and the impressive Victoria Regia (with world’s largest water lily), with leaves up to two meters in diameter, according to Colombia’s official tourism website. You can also climb trees, walk beneath the canopies, visit aboriginal tribes, sail on a floating house, and canoe along the Matamata stream. Canoe and lifejacket hire costs $10 for three hours, according to the Ministry of Tourism. Pro tip #2: Before sailing on a river or lake, take off your boots to be ready for any emergency. The second-largest town in the Amazon state, Puerto Nariño is 54 miles from Leticia and lies upon the shores of Loretoyaco River. Motorized vehicles are prohibited in Puerto Nariño, making it a peaceful place to visit. A trip to Puerto Nariño’s lookout point is a must as it provides a 360º view over the Amazon Rainforest, according to Colombia’s official travel website. Pro tip #3: It is cheaper to travel to the Amazonas in groups of four or more people, as guided tours are one of the easiest ways to get around the jungle, according to the Amazonas Colombia travel website. Just 30 minutes away from Puerto Nariño along the Loretoyacu River you will find the picturesque Tarapoto Lakes, where Pink Amazon Dolphins abound. The natives trace the species to a legend according to which the tribal gods were so envious of the handsomeness of an Indian that they turned him into a dolphin, according to Colombia’s official travel website. While indigenous communities in the Amazon have respected and feared the pink dolphin for thousands of years – believing bad luck will befall anyone who kills one – the species is currently in danger of extinction due to deforestation, pollution, and commercial fishing. If you’re feeling extremely adventurous, you might want to follow in the wake of Swiss man Herve Neukomm, the first person to explore the Amazon on a bicycle-driven boat in 2012-2013. The Swiss adventurer, who is an ardent supporter of energy efficiency, sustainable travel, and low impact living, peddled his bicycle-boat from Ecuador through Peru, Colombia, and Brazil, all the way to the Atlantic Ocean. The goal of his trip was not to reach the Atlantic as quickly as possible. Instead, Neukomm explored as many of the Amazon’s tributaries as he could in order to visit the truly remote places. 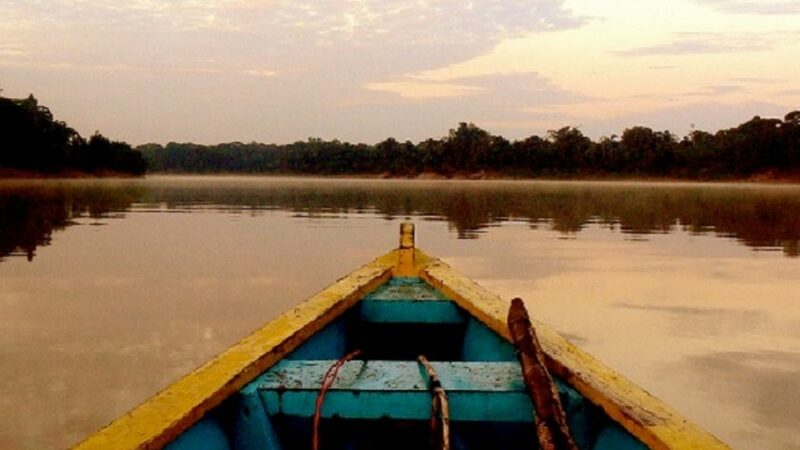 See Neukomm’s extraordinary Pura Vida – crossing the Amazon by a “bikeboat” on Vimeo. If you’re strapped for cash but still want to experience the wonders of the Amazonas, you can always volunteer. One such site dedicated to linking willing volunteers with hosts is www.workaway.info. The site offers opportunities to volunteer all over Colombia, from the bustling cities to the most remote of locations, and occasionally there are volunteer positions available in Colombia’s magnificent Amazonas region.